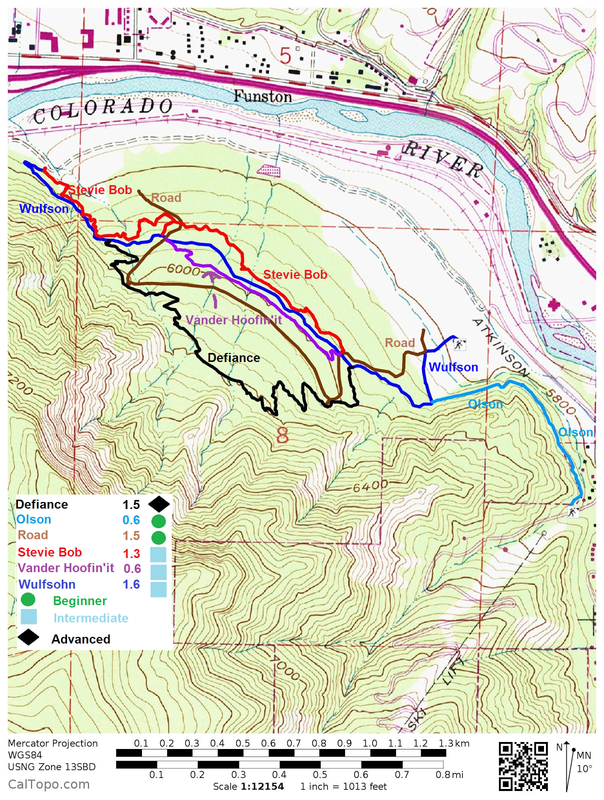 The Wulfsohn Mountain Park Road is an important connecting route that runs through the trail area by that name in Glenwood Springs. The road both parallels and intersects with almost every other trail in the park providing not only a means for getting from one trail to another but the opportunity to connect them in a myriad of ways to come up with a greater variety of routes. This post begins at the north end of the trail and follows it as it works its way through the mountain park to the Wulfsohn trailhead near the Community Garden and Glenwood Springs Community Center. For most of the route the surface of the path has been covered with a thin layer of gravel over a layer of fabric. The intents was probably to mitigate the effects of erosion while providing a good surface for hiking, biking and running. The road trends in the uphill direction at an easy pace. At the 0.14 mile point it is crossed by the Stevie Bob trail and as it approaches the quartermile point by the Wulfsohn trail. At the 0.35 mile point the trail begins arcing more toward the south and a short spur that leads over to the Defiance trail departs on the right. The trail also begins leveling off at this time. A park bench provides a good spot to rest and lookout over the valley. Perhaps even a nice place for a picnic. Several long and straight sections of the trail come up as the route continues. Heavy rains have caused flows of red dirt to cover the trail in places. At the 1 mile point the road begins bending more to the east and another short spur that connects to the Defiance trail departs once again on the right. The last half mile of the trail is a gentle descent. As the trial nears its end the option comes up to get off on the Wulfsohn trail and take it to the trailhead near the Community Garden or to continue on the road and come out on the sidewalk near some apartment buildings. For this post we stayed on the road all the way to its end near the apartments for the sole reason of having that portion of it show up on the map. 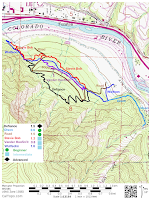 The routes on the map are an accurate depiction of the trails that was made from our actual GPS files. The trail ratings on the other hand are mere assumptions on our part. Combined with the following slideshow everything should serve you well to get a feel for what is available in the Wulfsohn Mountain Park.If you would like to see it for yourself then all you have to do is grab your bike or 'Take a hike'.